The list of people connecting the Buddha to Master Hui Neng is on the left below. After Master Hui Neng, Zen diversified into different schools, so each modern school would have, mostly, different names from then on wards. Leader of the Buddhist teaching in this historical period (there were other Buddhas before, whose teachings have been lost). He truly discovered the Truth without reliance on written teachings. The Buddha’s great follower, who was a considered a great monk, even before he met the Buddha. Famous for modest living and happy adherence to the precepts, he was the only follower that understood the Buddha’s “silent teaching”, making him the fist Patriarch of Zen. The Buddha’s attendant. He was instrumental in allowing women to become monks during the life of the Buddha. 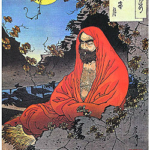 Bodhidharma brought Zen from India to China and lived in the Shaolin Temple that ironically became famous for Kung Fu hundreds of years later. He was an Indian person so his facial features were quite dramatic, to the Chinese. Accordingly, he is heavily stylized when depicted. The statue above is a very standard depiction, while the round, red ball thing on the top right is a unique, Japanese version. In Japan temples sell wooden versions in this style without eye pupils. You take it home and paint one pupil in before starting a big task, such as studying for a test. when the task is successfully completed, you paint the seconds pupil in and return him to the temple. Next Darma traveled north, eventually arriving at the Shaolin Temple. A popular legend claims he crossed the Yangtze River on a reed to get there. This is often depicted in images of him including the Ming Dynasty (1368-1644) figurine on the left. At Shaolin he spent nine years meditating while facing a wall. He took no disciples until one monk cut off his arm to prove his sincerity in relieving his suffering. The disciple was Master Hui K’o who became Darma’s successor. According to the legend, he told the official he was returning to India and carrying a single shoe. The resulting controversy caused the monks to open Darma’s grave where only a single shoe was found. Whatever the actual facts are, this led to yet another popular depiction of Darma as travelling with a single show in toe, as in the Qing Dynasty figure on the right. At the Shaolin Temple we teach Tamo’s Qi Gong Ba Duan Jin, Yi Jin Ching, Ssway and 18 Iron Palm.